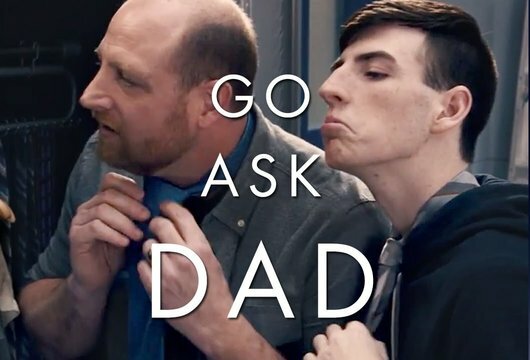 London, June 2017: Gillette, the world’s leading male grooming brand, has announced the return of its “Go Ask Dad” campaign with the aim of helping young guys through some of the toughest emotional moments in their lives. For the men of today, information is literally at their fingertips. At the touch of a button, smartphones serve as a gateway to countless how-to videos, resources and guides in a matter of seconds. However, when it comes to understanding and needing advice on the more complicated issues a young man will face, there is no better source than a dad. Gillette will demonstrate this sentiment with the release of a new, global “Go Ask Dad” video, which opens with sons from around the world beta testing what they think is the latest mobile artificial intelligence technology, by asking it questions about a range of topics. What they don’t know is that it’s their dad on the other side giving the advice. Grounded in Gillette’s Purpose Father’s Day is a moment to celebrate celebrate fatherly advice, an integral part of a man’s journey through manhood. Naturally, Gillette feel that they should play a role in sparking that emotional connection, bringing the father-son relationship closer together in an age where technology is so heavily depended on. For additional information on Gillette, as well as information on Gillette’s full lineup, including the latest shaving innovation, Gillette Fusion ProShield Chill, please visit: www.gillette.co.uk. About Procter & Gamble P&G serves consumers around the world with one of the strongest portfolios of trusted, quality, leadership brands, including Always®, Ambi Pur®, Ariel®, Bounty®, Charmin®, Crest®, Dawn®, Downy®, Fairy®, Febreze®, Gain®, Gillette®, Head & Shoulders®, Lenor®, Olay®, Oral-B®, Pampers®, Pantene®, SK-II®, Tide®, Vicks®, and Whisper®. The P&G community includes operations in approximately 70 countries worldwide. Please visit http://www.pg.com for the latest news and information about P&G and its brands.